Transfer your investments to our award winning service and make your life easier by reducing your administration and managing all of your investments in one place. Download our all-new app and trade funds today! After reading our Terms of Business, register and open an account online. Print, complete and return the Transfer Form(s). We then contact your existing provider to arrange the transfer of assets. The transfer turnaround time will depend upon the assets held with your existing provider. Once both the cash and the investments have been received we will notify you. What are the benefits of transferring? We offer share dealing from £11.50 per trade, free fund dealing and a maximum platform charge of 0.35% per annum. 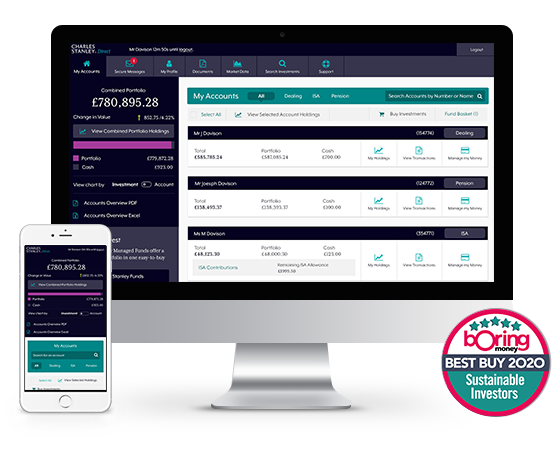 Take complete control over your investment strategy by managing all of your investments online in one place. When transferring take a minute to consider your portfolio and think about investments with more potential. Transfer and consolidate all of you existing investments under one roof minimising your paperwork and administration. If you have any doubt as to whether transferring an existing investment is a suitable course of action, please seek professional financial advice. Please note we recommend that you check with your existing provider to see if any charges are levied for transferring to us.